The horror stories keep coming but – even so – it is doubtful whether we have yet grasped in New Zealand the scale and seriousness of what is happening in the global economy, and how greatly we will be affected by it. We know that others are in deep trouble but we see ourselves so far as transfixed spectators rather than actors (or victims) in the drama. We may not remain in that comfort zone for long. As the world enters recession, and the markets for our goods are decimated, we will feel the pain. And, although our financial system seems unscathed for the moment, the price we will inevitably pay for being one of the world’s most indebted countries is waiting just round the corner. As foreign investors take their money home, and as our banks have to re-negotiate the credit arrangements on which they rely, stand by for a succession of damaging body blows to the already fragile underpinnings of our economy. There is little sign yet that our political and business leaders have grasped the dreadful vulnerability of our position. The cool reception given to the thoughtful paper issued last week by Mark Weldon and David Skilling – with Peter Dunne expressing concern about the impact on the government’s deficit, as though that was the foremost of our worries – shows that we do not yet recognise the imperatives that have driven governments around the world to take steps that would have been unthinkable just a couple of months ago. There is of course room for considerable discussion about the precise recommendations of the Weldon/Skilling paper. But it does at least represent the first awareness of the scale of the problem and of the need for new thinking. Even more interestingly, it points the way to a post-meltdown future where the world will (hopefully) never be the same again. The paper is notable mainly for its (perhaps unconscious) willingness to slaughter some sacred cows to which we have been solemnly assured for nearly three decades “there is no alternative”. Governments must be kept well away from the main levers of economic policy? No. As the paper now asserts (and as even George Bush agrees), government action is essential. Monetary policy is all that matters? No. The paper says that fiscal policy is now the most important weapon in the armoury. Bankers should be entrusted with the important decisions in our economy? No. As is apparent to everyone, banks worldwide have failed us and must in many cases be taken into public ownership. 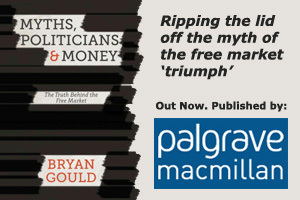 “Free” markets must be left unregulated and will always produce the best results? No. The market has failed and created a catastrophe. All that matters is the bottom line? No. The goals of economic activity are wider than profit for a few. The truth is, in other words, that if we are to survive the crisis in reasonable shape, we must now abandon the nostrums that have proved so self-destructive. We need governments to acknowledge their responsibilities, to take a major role in the rescuing of our economy, to use a much wider range of policy instruments, and to treat markets as hugely valuable servants but dangerous masters. We should be in a better position than most to recognise this, since we have given those nostrums a longer and more comprehensive trial than anyone else. While the great super-tankers and luxury liners of the big economies have plied their trade on the great ocean of the global economy, and amassed large fortunes until they suddenly sprang a leak and began to sink, our tiny craft has been waterlogged for years. For us, the dogma of the unregulated “free” market has not led so much to sudden collapse as to long decline. We now have the chance, if our leaders have the necessary wit and imagination, not only to change direction in order to escape the worst of the world recession in the short term, but to set a new course which will produce in the medium term a better balanced economy in a world where markets are no longer regarded as infallible. The lesson of this crisis is that unregulated markets lead to economic disaster and – even more importantly – that they are incompatible with democracy. If markets are always right and must not be challenged, the result is not only economic meltdown but government by a handful of greedy oligarchs rather than by elected representatives. The whole point of democracy is that it ensures that political power will be used to offset the otherwise overwhelming economic power of the big market players. If democratic governments do not, will not or cannot exercise that power to protect their electorates, the course is then set inevitably not only for the crisis we now face but also for the abuses and failures that disfigured our economies in the years preceding the crisis. Shouldn’t our politicians be called to account? Shouldn’t these issues be what our general election is all about? As the world economy threatens meltdown, Alan Greenspan – who, as Chairman of the Federal Reserve Bank, had presided over its fortunes from 1987 to 2006 – expressed himself as being taken aback by what he described as a once-in-a-century crisis. We were all invited, by implication, to join in his bewilderment at the apparently unheralded disaster that has suddenly struck us. If even Alan Greenspan had not seen it coming, we could all be excused for a similar failing, couldn’t we? Well, no. This is a crisis that has been thirty years in the making. Its approaching outline has been visible for a very long time. Only those who did not want to see (and that includes almost all the so-called expert commentators and actors in the drama) could have failed to register the warning signs. The first little alarm bell might have rung when, at the end of the 1970s and early in the 1980s, much of the world – following the lead provided by Margaret Thatcher and Ronald Reagan – removed exchange controls and allowed capital to move freely around the world. The result was a huge increase in capital flows as multinational investors roamed the globe, looking for the most favourable long-term, and often short-term, investment opportunities. In one bound, the controllers of that capital had decisively changed the balance of power between capital and governments, whether elected or otherwise. It was now the international investors who could face down governments, threatening to move their investment elsewhere if they did not get their way. The capital flows they controlled were sufficient to dwarf the resources of all but the biggest national authorities. The political agenda had been transformed; the democratic process, which was supposed to protect ordinary people from the predations of capitalism, had been disabled. This is not, of course, how it was portrayed at the time. On the contrary, it was represented as a dismantling of unnecessary and damaging controls. The way was now clear to establish a single global market which, by definition, excluded governments, since any government intervention in that market would mean that market conditions would vary from one part of it to another and it would no longer be a single market. As the external environment changed, so too did domestic conditions. The fashion was now for monetarism – the mechanistic application of supposedly simple rules for controlling the money supply and therefore inflation – a process which could safely be entrusted to officials and market operations and removed from the unreliable attentions of democratically elected politicians. Again, these developments were almost universally applauded as an overdue expression of the “free” market, not least by those who – it might have been thought – would most resist them. Yet, even then, they were not satisfied that they had done enough to shunt off democratic processes to the margins. They determined to ensure that governments were definitively excluded from economic policy by proclaiming that there was only one goal of that policy – the control of inflation – and that that task should be removed from those elected to undertake it and handed over to an unaccountable central bank. The principal decisions in economic policy were thereby virtually insulated against public debate and discussion. And, as the banks and financial institutions focused on making as much money as possible through manipulating assets and irresponsible lending, they could relax in the knowledge that the central bank was not only too busy with the task it had been given of shaping economic policy to bother about prudential regulation, but also that it would be too solicitous of the interests of its fellow banks to do anything about it anyway. So, the whole de-regulated international money-go-round whirled ever faster, the music played louder, the champagne flowed faster, and the world economy lurched from one crisis to another. But there was always another tranche of credit, or another clever idea for securitising debt, or another mega-merger, to keep the bubble floating. And then, in slow motion, the souffle began to collapse. As always, it is the victims of the excesses who now have to pay the biggest price for correcting them. It is all those who will lose their homes and their jobs and their living standards and their sense of self-worth who will bear the heaviest burden. In the meantime, poor Alan Greenspan! He couldn’t see it coming. Nor could all those bankers, politicians, commentators, financial experts and multinational potentates who so enthusiastically drove it all forward and were so dazzled by their good fortune that they could not recognise reality. But some of us saw it coming. You bet we did.